Seat(s): We mentioned in the American Airlines First Class review of seat 6B that, by appearince, it’s easy to mistake it for a pimped-out economy seat. Break out the ruler. You’ll find that there’s actually a good amount of hip space alongside a generous console. Legroom is isn’t bad either but if you’re tall, stretch will be limited by the bulkhead. 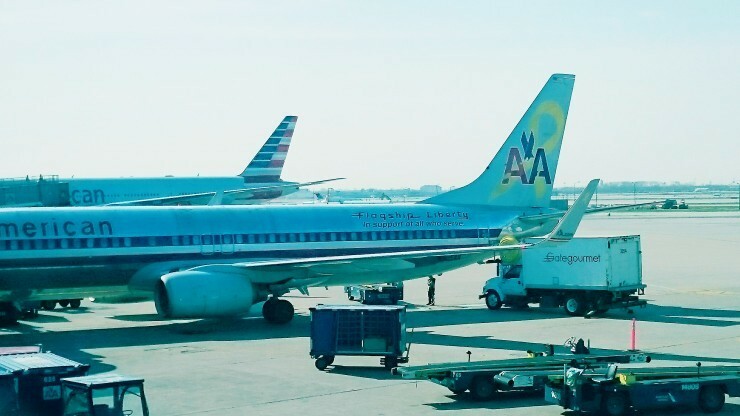 Aboard a newer, sexier AA 737-800, you’ll get your own. On this version, you’ll have to share your entertainment. Tech/Connectivity/Entertainment: When we talked to then US Airways SVP of Marketing & Planning Andrew Nocella (now SVP of Marketing for American) he hinted at a future rise in prices for in-flight wi-fi by mentioning that the pricing of services by provider GoGo were stuck in the past. Pricing for a full flight pass was north of $20 so it seems the airline and industry have adopted the “where else you going to get wi-fi right now?” pricing model. But yes, it’s available on this plane. Your gear is safe from auto-shutdown thanks to standard power ports and streaming movies/tv is available on the older versions of this plane (like this one) that don’t have seat-back entertainment. Wi-fi is pricey, but you get a cookie! Food: #Fail. We can only assume we enjoyed the meal on this flight as both video and notes seem to be missing. How we got em’: Look for upgrade opportunities online in advance of your flight or at an American Airlines kiosk when you get to the airport. We upgraded using Advantage miles via aa.com.